With people everywhere marking World Wildlife Day on 3 March, read the new BRS Press Release on the impact of chemicals and waste on our planet’s fauna. The impact of pollution - from chemicals and waste - on wildlife is far-reaching and its consequences are likely to be lethal to many species. Even the world’s seemingly pristine habitats show signs of pollution from plastics, whilst one group of toxic chemicals – the Persistent Organic Pollutants or POPs – are by their very nature able to travel long-distances, ending up in remote regions far from industrialisation such as the Arctic. Bird populations have long been known to be vulnerable to chemical pesticides, with the renowned writer Rachel Carson first bringing public attention to this in her seminal work from 1962, “Silent Spring”. Last year’s State of the World’s Birds report by Birdlife International found that more than 1,400 species, or 1 in 8 of all bird species, are currently threatened with extinction, with more than 1,000 species at risk from agriculture and a further 200 from pollution. Bees and other pollinators are similarly impacted by chemical use, with UN Environment recently noting that more than 75% of food crops and 90% of wild flowering plants are dependent upon pollinators for their existence and that the application of chemicals such as neonicotinoids is strongly implicated as adversely affecting bees and other pollinators. Sadly, the body of evidence for such impacts is growing. Recently, scientists concluded that entire populations of killer whales, for example, are threatened due to their exposure to just one group of POPs, known as PCBs - or polychlorinated biphenyls. Before being controlled under the UN’s Stockholm Convention when it entered into force in 2004, PCBs were widely produced and used in electric transformers and capacitors, and as additives in paint, carbonless copy paper, and plastics, especially in North America, Europe and Japan. Once released, PCBs found their way into the food chain and have accumulated in the bodies of killer whales or orcas (Orcinus orca sp.) where they have impacted upon the whales’ immunity and reproductive systems, leading to lower calving rates. Concentrations of chemicals such as PCBs may be transmitted from mothers to young already in the womb through the placenta, passing the toxic legacy on to future generations. As a result, populations of whales found in Brazilian, Japanese, Pacific north-west of America, United Kingdom, and northern Pacific (Biggs) waters are all tending towards complete collapse, as a result of PCB contamination. That PCBs were already banned in many countries several years ago shows how persistent these chemicals are, underlining the need for the fullest possible implementation of the Stockholm Convention, and its sibling conventions dealing with chemicals and waste, including the Rotterdam and the Basel conventions. The wide geographical extent of PCB contamination also stresses the need for global collaborative action towards the sound management of chemicals and waste. The international community will soon come together at the fourth UN Environment Assembly (UNEA-4: Nairobi, 11 to 15 March 2019), and again at the joint meetings of the conferences of the Parties to the Basel, Rotterdam and Stockholm conventions (Triple COPs: Geneva, 29 April to 11 May 2019) to consider proposals for strengthening international governance to deal with pollution, including from plastic waste and from POPs. The theme of the next Triple COPs is “Clean Planet, Healthy People: Sound Management of Chemicals and Waste”. For example, Parties to the Stockholm Convention will discuss listing the industrial chemical perfluorooctanoic acid (PFOA), its salts and PFOA-related compounds, widely used in domestic non-stick cooking ware and food-processing appliances, surface treatment agents in textiles, paper and paints, and in firefighting foams. The chemical is known to be toxic to humans and the environment with links to major health issues such as kidney cancer, testicular cancer, thyroid disease, and pregnancy-induced hypertension. Listing PFOA under the Convention would require its elimination, thus protecting current and future generations of people and wildlife from its harmful impacts. The Stockholm Convention on Persistent Organic Pollutants is a global treaty to protect human health and the environment from chemicals that remain intact in the environment for long periods, become widely distributed geographically, accumulate in the fatty tissue of humans and wildlife, and have harmful impacts on human health or on the environment. Exposure to Persistent Organic Pollutants (POPs) can lead to serious health effects including certain cancers, birth defects, dysfunctional immune and reproductive systems, greater susceptibility to disease and damage to the central and peripheral nervous systems. Given their long-range transport, global action is needed to protect citizens and the environment from POPs. In response to this global problem, the Stockholm Convention, which was adopted in 2001 and entered into force in 2004, requires its Parties to take measures to eliminate or reduce the release of POPs into the environment. As of today, this legally-binding Convention has 182 Parties, giving it almost universal coverage. To date, 28 chemicals of global concern have been listed under the Stockholm Convention. As International Mountains Day is marked around the world, and recognition grows that the global plastics problem is not restricted to our oceans, mountain experts call for renewed action to tackle plastic pollution. With public attention focussing largely on marine plastic litter, “a focus upstream on tackling the problem at source is required more than ever before”, says Carlos Martin-Novella, Deputy Executive Secretary of the Basel Convention, a nearly universal treaty aimed at ensuring the prevention and minimization of the generation of hazardous wastes and other wastes as well as their environmentally sound management, in addition to provisions aimed at controlling their exports and imports. Speaking at an event in Geneva, Switzerland today at which mountain experts were brought together to discuss ways forward for relieving mountain regions from the pressure of pollution, Martin-Novella went on to say that “the fact that even high-altitude mountains like the Alps – thought to be a relatively clean environment - are significantly polluted by plastics shows that we really cannot wait, we must strengthen existing international instruments and we must accelerate their implementation.” Recent research also identified microplastic pollution even high up in the Swiss mountains, with researchers concluding that this microplastics contamination must be windborne. Central to minimising waste, including plastics, is tackling waste generation at the household level. Household waste – a major challenge especially for developing countries – is particularly difficult since not only is the quantity of waste generated increasing rapidly, but the composition of that waste is changing rapidly as well. For that reason, a Basel Convention Partnership on Household Waste was initiated in 2017 to explore and disseminate innovative solutions, an integrated approach, avoidance and minimisation of waste at source as well systems for the collection, separation, transport, storage, treatment, processing, recycling and where necessary, final disposal, of household waste. More information is available here. Indeed, world attention continues to be focussed on the problems associated with plastic waste. A multi-faceted problem which will require multiple solutions, the Basel Convention offers avenues for minimising plastic waste generation at source and promoting their environmentally sound management, which led to a decision at a recent experts’ meeting in Geneva proposing a new Partnership on Plastic Wastes under the Basel Convention. This partnership, which could be established by Parties in May next year, would be an international vehicle for public-private cooperation, sharing of best practices, and technical assistance in the area of at-source measures to minimise and more effectively manage plastic waste, thus helping tackle the global environmental problem of plastic litter, including in the oceans. More information on minimising plastic wastes is available here. As World Habitat Day is marked around the world and attention is focussed on the challenges for improving solid waste management, a UN convention on waste strengthens the partnership approach to develop and disseminate best practices for waste minimisation. These partnerships have been initiated and facilitated by the Basel Convention, and feature alliances of government, the private sector, local municipalities, civil society and environmental organisations. They identify, develop, and disseminate innovative approaches for solid waste management, targetting some of the most urgent waste streams through the development of technical support to countries for the environmentally sound management of waste. The press release of the 14th meeting of the POPs Review Committee is available online. The Press Release of the 14th Meeting of the Chemical Review Committee, which closed on 13 September in Rome, is available online. With the goal to protect human health and environment by assisting governments to make informed decisions concerning trade in pesticide and industrial chemicals, the UN Rotterdam Convention’s Chemicals Review Committee held its 14th meeting at the Food and Agriculture Organization (FAO) Headquarters in Rome, from 11 - 13 September 2018 with chemicals experts from all the UN regions attending the meeting. The industrial chemical perfluorooctanoic acid (PFOA), its salts and PFOA-related compounds, widely used in domestic non-stick cooking ware and food-processing appliances, surface treatment agents in textiles, paper and paints, firefighting foams and is known to be toxic to humans and the environment with links to major health issues such as kidney cancer, testicular cancer, thyroid disease, and pregnancy-induced hypertension. The Rotterdam Convention on the Prior Informed Consent Procedure (PIC) for Certain Hazardous Chemicals and Pesticides in International Trade, is jointly administered by the United Nations Food and Agriculture Organization (FAO) and UN Environment (UNEP). The 160 Parties to this legally-binding Convention share responsibility and cooperate to safely manage chemicals in international trade. To date 50 chemicals and pesticides are listed in its Annex III. The Rotterdam Convention does not introduce bans but facilitates the exchange of information among Parties on hazardous chemicals and pesticides, and their potential risks. The information can be used to inform and improve national decision making. In addition, through the PIC Procedure, it provides a legally binding mechanism to support national decisions on the import of selected chemicals and pesticides in order to minimize the risk they pose to human health and the environment. Erik Solheim, Head of UN Environment, and Rolph Payet, BRS Executive Secretary, shared a platform in Arendal, Norway on 15 August 2018 to raise awareness on toxic chemicals and their impacts on human health. Rome: 30 October 2017 In keeping with recent calls for commitments from all to contribute towards a pollution-free planet, experts and observers joined members of the Rotterdam (RC) and Stockholm (SC) Conventions’ chemical review committees for back-to-back meetings in Rome in recent days and reviewed a record number of chemicals for inclusion in annexes of the two Conventions, both of which aim to protect human health and the environment. Discussions concluded on 26th October and three more chemicals are recommended for inclusion in the Rotterdam Convention, whilst two more are recommended for inclusion in the Stockholm Convention. More than 250 experts and observers in total, from all regions of the world, gathered at the headquarters of the Food and Agriculture Organization of the United Nations (FAO) in Rome to conduct back-to-back meetings focussed on the review of scientific information on toxic chemicals, with a view to recommending inclusion in the annexes of the two conventions, thus becoming regulated by international law. According to the latest FAO data, international pesticide sales are valued at up to USD 480 billion a year. 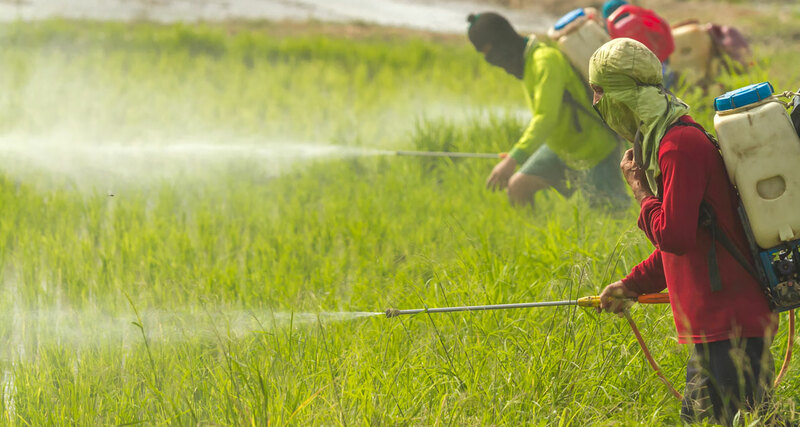 UNEP estimates that as many as three percent of those working in agriculture worldwide suffer from acute pesticide poisoning, with adolescents facing a higher risk. The Rotterdam Convention - which currently has 159 Parties - provides an early warning on the trade of certain hazardous chemicals and pesticides, through the Prior Informed Consent (PIC) procedure, a mechanism that requires Parties to take informed decisions on the future import of these chemicals. The 13th meeting of the Chemical Review Committee (CRC) of the Rotterdam Convention, which was held back-to-back with POPRC and which concluded on 26 October, successfully recommended to the COP the listing of phorate, acetochlor and hexabromocyclododecane in Annex III of the Convention. Acetochlor, a selective herbicide, has been used on maize in Sahelian west African countries. It poses a high risk to aquatic organisms as well as long-term risks to herbivorous birds and to humans. Phorate, a pesticide, has been used for example in Brazil as an insecticide in cotton, potato, coffee, beans and corn and is considered one of the most toxic organophosphate AChE inhibitors. Hexabromocyclododecane - is a brominated flame retardant already listed in the Stockholm Convention in Annex A and used as a flame retardant additive to provide fire protection during the service life of vehicles, buildings or articles, as well as protection while stored and in selected electronic products. In reflecting on keys to the successful meetings, William Murray, Executive Secretary of the Rotterdam Convention (RC) for FAO, concluded that “National capacity-building has contributed substantially to sound chemicals management, which is essential to sustainable agriculture and, ultimately, food security”. “Notwithstanding the scientific and technical aspects of the work of the CRC, the outcomes are felt at a much wider spectrum of the global chemicals and wastes management agenda, including implications for human and environmental health, sustainable development, food security and socio-economic considerations” said Rolph Payet, Executive Secretary of the Basel, Rotterdam and Stockholm Conventions for UNEP. “These decisions will further protect human health and the environment from hazardous chemicals and will guide the international community towards not just a pollution-free planet, but also towards implementing the SDGs through the sound management of chemicals and waste” he added. The Stockholm Convention - which currently has 181 Parties - aims to eliminate or restrict the use of chemicals referred to as “Persistent Organic Pollutants” (POPs), which are among the most toxic substances found on earth and thus posing serious threats to human health and the environment. The next step will be for the respective Conferences of the Parties to decide whether to formally list these chemicals at their next meetings in Geneva in April 2019. The 13th meeting of the Stockholm Convention’s Persistent Organic Pollutants Review Committee (POPRC) met from 17 to 20 October, and recommended listing by the next COP of two highly toxic chemicals, namely dicofol, and PFOA, its salts & PFOA-related compounds, in respectively, Annex A and Annex A or B to the Convention. On PFOA, its salts and PFOA-related compounds, further work is expected by the Committee at its next meeting to define the need for possible specific exemptions for certain applications in the view of strengthening its recommendation to the COP. Dicofol is an organochlorine pesticide structurally similar to DDT. Often used as a foliar spray on agricultural crops and ornamentals, and in or around agricultural and domestic buildings for mite control. PFOA - or pentadecafluorooctanoic acid -, its salts and PFOA-related compounds are used in a wide variety of applications and consumer products across many sectors, e.g. semiconductor industry, imaging and printing industry, textiles, fire-fighting foam, medical devices. The Committee was also satisfied that the proposal submitted for listing PFHxS, its salts and PFHxS-related compounds to the annexes of the Convention met the required criteria, moving this group of substances to the next stage of the listing process, which requires the development of a risk profile. PFHxS are used as a surfactant to make fluoropolymers and as water- and stain protective coatings for carpets, paper and textiles. The next meetings of the Conferences of Parties (COPs) for both conventions, together with that of the Basel Convention on the Control of Transboundary Movements of Hazardous Wastes and their Disposal, will be held in Geneva in April 2019. The Rotterdam Convention on the Prior Informed Consent Procedure for Certain Hazardous Chemicals and Pesticides in International Trade creates legally binding obligations for its currently 155 parties. It currently covers 50 chemicals, pesticides and pesticide formulations. The Chemical Review Committee consists of thirty-one scientific experts appointed by the Conference of the Parties to the Rotterdam Convention charged with undertaking scientific review of chemicals proposed for listing. The Stockholm Convention on Persistent Organic Pollutants, or POPs, creates legally binding obligations for its 181 Parties and currently includes 26 chemicals listed within its annexes. The POPs Review Committee consists of thirty-one scientific experts appointed by the Conference of the Parties charged with undertaking scientific review of chemicals proposed for listing. May 5, Geneva – Significant steps were agreed upon by parties to the Basel, Rotterdam, and Stockholm Conventions (BRS), as the 2017 Triple COPs drew to a close in Geneva this week. Hosted under the headline, “A future detoxified: sound management of chemicals and waste,” participants reached consensus over a range of issues at the largest ever meeting of the Conventions to-date, attended by around 1,300 participants from more than 170 countries. Eighty ministers took part in high-level talks on the final days of the two-week-long event, which began on April 24. The Basel, Rotterdam and Stockholm Conventions share the common objective of protecting human health and the environment from hazardous chemicals and wastes. All three Conventions made good progress on their stated targets of reducing dependence on toxic substances and promoting ecologically sound alternatives to pest control, paving the way towards a safer world. “We have seen a surge in positive commitments from governments. The relevance and importance of the BRS Conventions is therefore central to achieving sustainable development, the eradication of poverty and a peaceful and fair world. The sustainable management of chemicals and waste must be met, in order for our health and that of our children to be protected, wherever we live, and whatever our job, whatever our gender, nationality or income,” said UNEP’s Executive Secretary of the three Conventions, Rolph Payet. The Basel Convention agreed a number of important decisions including the establishment of a new public-private Partnership on Household Waste, to assist countries deal with this issue of growing concern, and gave a mandate to begin tackling marine litter, a key challenge of our time. By consensus, the Rotterdam Convention (RC) added three new chemicals to Annex III. These are two pesticides, carbofuran and trichlorfon, and one industrial chemical, short-chain chlorinated paraffins (SCCPs) – traces of which have been found in air, waterways and sediments. The addition of these highly toxic substances brings the total number of chemicals listed under the RC to fifty one. The COP also added tributyltin (TBT) under industrial chemicals category in addition to pesticides category. No agreement was reached, however, on chrysotile asbestos, carbosulfan, and pesticide formulations paraquat dichloride formulations and fenthion, although many Parties expressed their willingness to do so in order to ensure the best information exchange on these hazardous chemicals. Listing does not constitute a ban, but does however enable Parties to make informed decisions on future imports of these chemicals, based on a structured information exchange, also called the Prior Informed Consent (PIC) Procedure. “It is clear that agriculture in 2017 and beyond must produce more, while at the same time protecting and enhancing the underlying natural resources on which it is based. The need for more varied, specialized and innovative approaches, that draw on traditional knowledge and advances in science and technology will only be addressed through greater collaboration and cooperation at all levels,” said FAO’s Executive Secretary of the Rotterdam Convention (RC), William Murray. Achieving global food security and improved livelihoods for all requires a sustainable approach to the intensification of agricultural production. Healthy soil, clean water supplies and biologically diverse ecosystems are essential components in building a detoxified future. The Stockholm Convention succeeded in listing all of the Persistent Organic Pollutants (POPs) which had been recommended, namely decaBDE and short-chain chlorinated paraffins (SCCPs) in Annex A and hexachlorobutadiene (HCBD) in Annex C. In listing, these substances will now be reduced and eliminated, for the benefit of current and future generations. The safe management of chemicals and wastes are essential for the implementation of the UN’s Sustainable Development Goals (SDGs) on poverty reduction, health, gender, water, cities, oceans, food and sustainable consumption and production. The role of the private sector was prominent throughout, including at the first ever Technology Fair which showcased solutions for implementing the three conventions. Parties renewed their commitment to work together, enhance efficient implementation of the conventions and strengthen synergies for a detoxified future. Carbofuran: an insecticide with trade name Furadan used to control soil insects in fruit and vegetable production, with negative impacts upon the environment including on birds, small mammals, and bees. Trichlorfon: an insectide or pesticide with trade name Cekufon 80 SP in Europe, Dipterex in Brazil and others, used on fruits and vegetables causing acute neurotoxic and carcinogenic effects and impacts on human reproduction and the endocrine system. Short-chain chlorinated paraffins (SCCPs): an industrial chemical with numerous trade names including Chlorowax, A70 (wax) and Chlorofo, used as a softener in paints, plastics fillers and coatings and as a flame inhibitor in rubber, plastics and textiles - traces of which have been found in air, waterways and sediments posing particular risks to soil and water-dwelling organisms. Decabromodiphenyl ether (commercial mixture, c-DecaBDE): an intentionally produced chemical used an additive flame retardant including in plastics, textiles, adhesives, sealants, coatings and inks. C-decaBDE containing plastics are used in electrical and electronic equipment, wires and cables, pipes and carpets, transported over long-range and with significant adverse human health and environmental effects, including adverse effects to reproductive health and output in a number of species as well as developmental and neurotoxic effects, and endocrine disruption. Short-chain chlorinated paraffins (SCCPs): see above as per Rotterdam Convention. Hexachlorobutadiene (HCBD): a Persistent Organic Pollutant already listed under Annex A of the Stockholm Convention, now additionally listed under Annex C, most commonly used as a solvent for other chlorine-containing compounds causing systemic toxicity following exposure via oral, inhalation, and dermal routes. Effects may include fatty liver degeneration, epithelial necrotizing nephritis, central nervous system depression and cyanosis. 24 April 2017, Geneva – Over 1,600 representatives from more than 180 countries as well as observers including from civil society groups and the chemical and waste industries are gathering in Geneva to discuss measures to promote the sound management of chemicals and wastes. The two week-long Triple Conferences of the Parties (COPs) to the Basel, Rotterdam and Stockholm (BRS) Conventions aims to strengthen the three international treaties contributing to the global management of hazardous chemicals and waste. "Chemicals constitute the building blocks of modern life. But without ensuring the environmentally sound management of chemicals and the phase-out of especially hazardous substances, we will continue to see more lives lost to poisoning, contamination and pollution. What we need to address this crisis is stronger regulatory action taken at national and international levels. That is why this meeting of the parties to the Basel, Rotterdam and Stockholm conventions is so critical. Only through cooperation and collaboration can we hope to create a detoxified future for everyone," said Ibrahim Thiaw, UN Environment Deputy Executive Director. Staged under the theme “A future detoxified: sound management of chemicals and waste,” Parties will seek to reach consensus over a range of issues. For the Rotterdam Convention (RC), this includes eight proposals for adding carbofuran, carbosulfan, trichlorfon, fenthion, paraquat, chlorinated paraffins, chrysotile asbestos and tributyltin to the RC’s “watch list” – also known as Annex III. Forty-seven chemicals make up the current list of substances deemed hazardous to human health and the environment and which are subsequently subject to the Prior Informed Consent (PIC) Procedure. Parties will also consider ways to strengthen the effectiveness of the Convention and seek to adopt compliance procedures and mechanisms. “FAO and UNEP each provide unique expertise to support Parties to address the challenges of managing hazardous chemicals and pesticides. They also help countries to streamline the UN Sustainable Development Goals (SDGs) into their national agendas. This Conference is an excellent occasion to work together to build on the impressive results we have already achieved” said FAO’s Deputy Director for the Plant Production and Protection Division and Co-Executive Secretary of the Rotterdam Convention (RC), William Murray. For the Stockholm Convention, issues include proposals for listing decabromodiphenyl ether (commercial mixture, c-decaBDE) and short-chain chlorinated paraffins in Annex A for elimination as well as hexachlorobutadiene (HCBD) in Annex C which targets the reduction and ultimate elimination of the unintentional releases of the chemical. Among the other issues that will get priority attention of Parties to the Stockholm Convention (SC) is the development of compliance procedures and mechanisms, and the first ever evaluation of the effectiveness of the Convention. The Conference will consider the progress the Convention is making in achieving its objective of protecting human health and the environment from Persistent Organic Pollutants (POPs), measured against a framework of indicators provided by the COPs. For the Basel Convention (BC), the COPs will consider prevention and minimization of the generation of waste which is the subject of new guidance to assist Parties, and a set of practical manuals for the promotion of the environmentally sound management of wastes and revised fact sheets on specific waste streams all of which have been prepared by an expert group on environmentally sound management. Other work under consideration includes two new and four updated technical guidelines for Environmentally Sound Management (ESM) of POPs, a glossary of terms to provide further legal clarity and guidance on dealing with illegal traffic developed by the Implementation and Compliance Committee. Parties will also consider establishing a new partnership focusing on a major waste stream, household waste. The Conferences will also examine progress in the implementation of the Conventions among participating Parties, in particular in developing countries and countries in transition where handling hazardous chemicals throughout their lifecycles presents greater challenges. Those attending will attempt to make progress on the sharing of information on hazardous chemicals and strive to build further international cooperation and coordination regarding their usage. More than 40 side events will be held during the biennial event. Among the topics being presented are mercury waste management, pesticide risk reduction, hazardous work in agriculture, child labour and methods to safeguard the human rights of those facing exposure. A technology fair will highlight the importance partners such as industry and private sector groups play in developing new technologies for the safe management of chemicals and promoting opportunities for developing alternatives. On May 4 and 5, government ministers and delegates will participate in a high-level session to discuss themes ranging from creating a detoxified future; to meeting the targets of the 2030 Agenda for Sustainable Development; generating greater opportunities to implement the Conventions through partnerships; and techniques to cut waste and pollution while facilitating economic and social prosperity. Achieving SDG 12 – which sets out to secure the environmentally sound management of chemicals and all wastes throughout their life cycle, in order to minimize their adverse impacts on human health and the environment – will take centre stage. Geneva & Rome: 26 September 2016 - Experts and observers joined members of the Rotterdam (RC) and Stockholm (SC) Conventions’ Review Committees in Rome in recent days to consider available scientific evidence concerning a number of hazardous chemicals for inclusion in annexes of the two Conventions, both of which aim to protect human health and the environment. The Rotterdam Convention – which currently has 155 Parties – provides an early warning on the trade of certain hazardous chemicals and pesticides, through the Prior Informed Consent (PIC) procedure, a mechanism for disseminating the decisions of importing Parties. The Stockholm Convention – with currently 180 parties – aims to eliminate the use of certain toxic chemicals, specifically those referred to as “Persistent Organic Pollutants” (POPS). The latter obliges governments to regulate the production, use and trade of specific chemicals throughout their life cycles. The 12th meeting of the Chemical Review Committee (CRC) of the Rotterdam Convention, which concluded on 16 September, agreed to recommend the listing of carbofuran suspension concentrate 330 g/L as a severely hazardous pesticide formulation in Annex III of the Convention, following a proposal from Colombia. The meeting also finalized draft decision guidance documents on two highly toxic pesticides – carbofuran and carbosulfan – used to control insects in a wide variety of crops. The next step will be for the Conference of the Parties at its meeting in 2017 to decide whether to list these two pesticides in Annex III of the Convention and subject them to the PIC procedure. 47 chemicals are currently listed in the Annex, including pesticides and industrial chemicals that have been banned or restricted by two or more Parties. “It is important to note that the basis for the consideration of these pesticides by the CRC were decisions taken by developing countries. Decisions that are leading to action at the global level,” said William Murray, Executive Secretary of the Rotterdam Convention (RC) for the FAO. When used appropriately, pesticides can help to protect food and other crops from excessive damage by pests and diseases. They can also protect humans and livestock from diseases. Misuse of pesticides however, is not only a threat to those earning a living through farming but also to the environment and the economy. The Stockholm Convention’s Persistent Organic Pollutants Review Committee (POPRC) then staged its 12th meeting, back-to-back with the CRC, and concluded its work on 23 September by agreeing to propose two new industrial chemicals for inclusion in the Convention’s annexes. Short-chain chlorinated paraffins (SCCPs) are mostly used in manufacturing of products such as polyvinyl chloride (PVC) plastics, and used in metalworking fluids. These highly persistent and toxic compounds have been found in breastmilk of Inuit women in the Arctic, demonstrating their persistence and long-range environmental transport. Listing in Annex A for elimination by the COP is proposed. The Committee considered and adopted additional information for decabromodiphenyl ether (commercial mixture, c-decaBDE), widely used as flame retardants, defining necessary specific exemptions related to automotive industry, for this chemical’s listing in Annex A of the Convention by the COP. The Committee evaluated the new information on hexachlorobutadiene (HCBD) and concluded that there are unintentional releases of HCBD from the certain chemical production processes and incineration processes. In 2013, the Committee recommended listing of HCBD in Annexes A and C and in 2015, the COP listed it in Annex A. Annex C lists chemicals subjects to the measures to reduce or eliminate releases from unintentional production. Progress was also made on pentadecafluorooctanoic acid (PFOA, or perfluorooctanoic acid), its salts and PFOA-related compounds, and dicofol, for which the Committee adopted the respective Draft Risk Profiles, moving them to the next review stage, requiring a risk management evaluation that includes an analysis of possible control measures. Finally, the Committee endorsed the guidance on alternatives to perfluorooctane sulfonic acid (PFOS) and its related chemicals to assist countries in phasing-out of those chemicals listed under the Convention. “Both the CRC and POPRC meetings were effective and productive and have paved the way for important decisions to be taken at our triple COPs in April next year,” said Rolph Payet, Executive Secretary of the Basel, Rotterdam and Stockholm Conventions for UNEP. “These decisions will further protect human health and environment from hazardous chemicals and will guide the international community towards not just a future detoxified, but also towards implementing the SDGs through the sound management of chemicals and waste” he added. The next meetings of the Conferences of Parties (COPs) for both conventions, together with that of the Basel Convention on the Control of Transboundary Movements of Hazardous Wastes and their Disposal, will be held in Geneva from 24 April to 5 May 2017 under the title “A Future Detoxified: Sound Management of Chemicals and Waste”. The Rotterdam Convention on the Prior Informed Consent Procedure for Certain Hazardous Chemicals and Pesticides in International Trade creates legally binding obligations for its currently 155 parties. It currently covers 47 chemicals, pesticides and pesticide formulations. Carbofuran is a WHO class Ib pesticide and used to control insects in a wide variety of field crops, including potatoes, corn and soybeans. It is extremely toxic via the oral route and by inhalation (LD50 2 mg/kg in mice) . It is also highly toxic to freshwater invertebrates and extremely toxic to birds. Carbosulfan is a broad-spectrum carbamate insecticide used to control various insects, including locusts and different types of grasshoppers, mites and nematodes mainly on potatoes, sugar beet, rice, maize and citrus. It is highly toxic to birds, aquatic invertebrates and bees. The Stockholm Convention on Persistent Organic Pollutants, or POPs, creates legally binding obligations for its 180 parties and currently includes 26 chemicals listed within its annexes. Important technical and legal steps were taken by two subsidiary bodies of the Basel Convention last week at meetings held in Nairobi, Kenya. The Basel Convention’s OEWG is at the heart of efforts to reach several of the 2030 sustainable development goals, while the ICC is central to measuring progress towards these goals. Highlights of these meetings include progress towards the establishment of a new public-private global partnership on household waste; progress on defining guidance to countries on the environmentally sound management of E-waste and POPs waste; and progress with 12 specific submissions concerning individual Parties’ compliance and on a range of other issues of implementation and compliance with the Convention. Held back-to-back with the 2nd United Nations Environment Assembly, UNEA2, the 10th meeting of the Open-ended Working Group of the Basel Convention (OEWG-10) took place from 30 May to 2 June and focused on the development of guidelines that promote the environmentally sound management (ESM) of wastes and on improving national reporting. Some 210 experts gathered from all over the world, including representatives from national governments, international organizations, civil society and the private sector. With funding support provided by Denmark, Germany, Finland, Japan and Sweden, strong inputs were secured from developing countries. A series of concrete steps were agreed, through the adoption of 13 decisions setting direction for further work on waste management until the next Conference of Parties, COP-13, which will be held in Geneva in April 2017. The OEWG provides a leadership role in the development of the technical guidelines for the ESM of specific wastes types or waste streams, which are especially useful in national waste management activities. OEWG-10 passed decisions relating to guidelines on the three newly-listed persistent organic pollutants (POPs) in the Stockholm Convention; and guidelines on e-waste, the fastest growing waste stream in the world today. The work programme for the OEWG for 2018-2019. It is estimated that, by 2018, there will be 50 million metric tonnes of e-waste produced per year, far-outstripping current capacities to properly manage it in an environmentally and socially appropriate manner. E-waste is a fast-growing wastestream and poses a number of serious threats to human health and the environment. Conversely, if undertaken in an environmentally sound manner, e-waste recycling can offer sustainable livelihoods, green and decent work, and contribute to the development of a circular economy and the transition to a greener, more inclusive economy. The E-waste technical guidelines are designed to assist governments protect human health and the environment through sound management of waste, and also offer important clarification regarding the question of “what is waste” in order to guide receiving and sending countries as to which types of product constitute e-waste and therefore fall under the jurisdiction of the Basel Convention. For more on the outcomes of this meeting, including the technical guidelines and other OEWG products, please go to our website. The 12th meeting of the Implementation and Compliance Committee of the Basel Convention (ICC-12)) took place on 4-6 June 2016, under the chairmanship of Mr Juan Simonelli (Argentina). The goal of the Basel ICC is to assist Parties implement and comply with the Convention. ICC-12 considered twelve specific submissions regarding Party implementation and compliance. Among other things, the ICC decided that the compliance matters regarding Afghanistan and Togo were resolved, it approved two compliance action plans submitted respectively by Eritrea and Liberia as well as new compliance action submitted by Togo, and it monitored the progress made by Bhutan, Cabo Verde, Central African Republic, Guinea-Bissau and Swaziland in implementing their compliance action plans with the support of the implementation fund. Measures to improve the development of adequate national legal frameworks. For more on the outcomes of this meeting, please go to our website. The Basel Convention on the Control of Transboundary Movements of Hazardous Wastes and their Disposal is the most comprehensive international environmental agreement on hazardous and other wastes and has 183 parties. See www.basel.int. The Secretariat of the Basel, Rotterdam, and Stockholm Conventions, or BRS, supports parties implement the three leading multilateral environment agreements governing chemicals and waste, in order to protect human health and the environment. See www.brsmeas.org.